I was stunned to find out that a major reason there is so many millions dying of starvation in African countries each year is that, of the 10 countries that the Nile River runs through, only 1 of these countries has the ‘right’ to use the water from the river for irrigation/farming/transportation or any other purpose! This is because Egypt supposedly ‘owns’ the water ‘rights’ of the Nile River. As if anyone really ‘owns’ any part of mother earth. It is merely a concept, an idea someone came up with to enforce safety measures against those that intrude and steal or more often, simple greed, to keep all for oneself or ones ‘country’. Why cannot we not keep the safety measures but forgo the unfair idea of ownership? Answer, we can! If you think of two children fighting over a toy, the one child crying ‘it’s mine’ , he only ever gets to ‘keep’ it if he is bigger/stronger, or someone else (the adult) intervenes and says what the ‘rule’ is. It seems back in 1925 there was a treaty signed between Britian, who held Dominion over much of the African continent=came with weapons and murdered people to steal the wealth of the African countries and take it back ‘home’ to Britiian. Back then, Egypt and Sudan were Britain’s source of cotton and Britian knew that their rate of production was only possible through the Nile and the use of massive irrigation systems. So in this treaty Britian and Egypt decided that the Nile belonged to Egypt AND and that no-one is allowed to do anything with the water that, as a consequence, will lessen the amount of water that ends up in Egypt, thereby insuring Britian’s cotton crop production. That’s right, they just decided=they made it up! No complicated economic theory needed here, they did this just because they could, because their stick was bigger than the other countries sticks. Just like the two little children fighting over the toy, they were bigger and stronger so got their way. It’s all about power and control and greed. But supposedly they based this decision on the fact that Egypt has a 7000 year history with the Nile, way back starting with the Pharoas so historically and traditionally belongs to them. Well, we have to stop referring to history and the past to make decisions based on today. Instead, we must use common sense and compassion to decide upon an approach that is best for all life, which in this case would be all countries through which the Nile flows, are able to use this natural resource to better their economy and support the population! Another reasons for this decision was it had been determined that Egypt was the country which had made most efficient use of the Nile, in economic terms. So what? Are we not all life? Does a newborn baby today deserve to suffer starvation and die in agony because 85 years ago it’s birth country did not make as efficient use of the Nile as Egypt? We are talking here about an invisible dividing line (again made up by human beings) separating the land and people into ‘countries’. It is not in fact ‘real’, we make it real by our agreement to participate. Also, let not the fact escape us, that ‘efficient use’ of the Nile meant that Egypt produced cotton for Britian which they could profit from and provide clothing for their people, total self interested motives. The invisible lines have to come down as we wake up to the fact that, this approach, is not what is best for all, as life one and equal. No hoarding commodities, such as cotton, so you can control supply and demand, thereby controlling prices at the expense of millions of others. Can you honestly look in the mirror or in your child’s eyes and say your child does not deserve to have a comfortable, enjoyable, dignified life but the child across the invisible line=boarder, does? There is a difference is the quality of life because there is a different starting point of the two children, this is inequality. I am not suggesting we eliminate boarders as they provide logistical reference points so we can communicate and move about on our earth. I am suggesting we understand that boarders are nothing more than that–lines we have made up for practical purposes. We do not need to kill each other over imaginary lines! One planet needs one goal; decisions based upon the principal of what is best for all life, period. Sadly, Ethiopia, which was the only African country that was never colonized, simply had ‘no legal representation’ and thus no say in the matter when this treaty was being written and signed, while over 80% if the water that ends up in Egypt originates from Ethiopia! Alot of the countries, when the treaty was being signed, were also too busy focusing on just surviving, so they didn’t really pay attention to the treaty or started thinking of some magnificent irrigation system as they simply did not have that luxury. After independence from Britian, a few African countries declared the treaty as void but the treaty was never really challenged and nothing was every really done about it because the other countries were scared of Egypt’s military force, also knowing that Egypt still has strong ties with Britain’s, a powerful nation indeed. 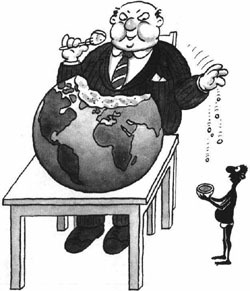 So every year Ethiopia and other countries get millions of dollars into the country as ‘food aid’. Also, realize, that when this investment as food is eaten, it is gone. 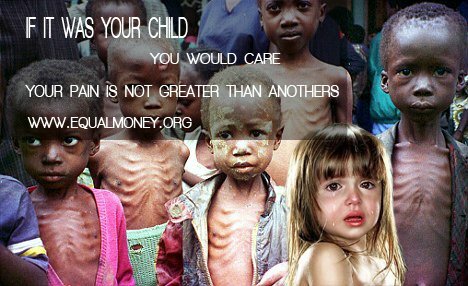 The problem remains, charity is not effective as a solution to starvation. Crazy, when there is the Nile flowing right through their land! A sickening consequence of the Nile River ‘ownership’ issue: wasted food and food aid. There exist warehouses in Ethiopia FULL of food, grown right there in Ethiopia. And a warehouse next door FULL FULL with bags of food with the American flag on it, food aid food. So all the food these poor farmers worked so hard for, just rots away and then you end up with a whole nation of people being dependent on food aid. Insanity plain and simple, theft of 9 African countries ability to stand on their own feet, live with dignity, provide sustenance and jobs for their population.